Attending the MCM Expo in London is an exhilarating, tiring and joyous experience. It’s basically a convention packed to the ceiling with video game booths, anime merchandise and independent comic book artists. If you’re interested in any of the above, I highly recommend checking out this event in the future. The photographs below show off some of the titles which I was lucky enough to play and watch. You can’t get around it. Visually, Solarobo: Red the Hunter has a lot in common with the Star Fox franchise. Cute animals pilot giant mechs or flying airships, happily exploring a futuristic fantasy world. 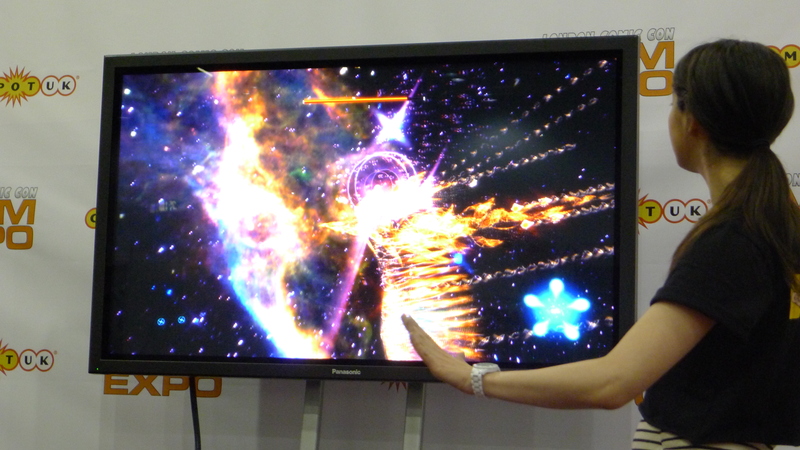 Developed by CyberConnect2, Solarobo is said to be the spiritual successor to Tail Concerto. The DS title uses a fairly decent 3D engine, although most of the gameplay mechanics felt fairly unimaginative. Meh. Warner Bros continued to push Batman: Arkham City, although they were only showing an old trailer on the floor. 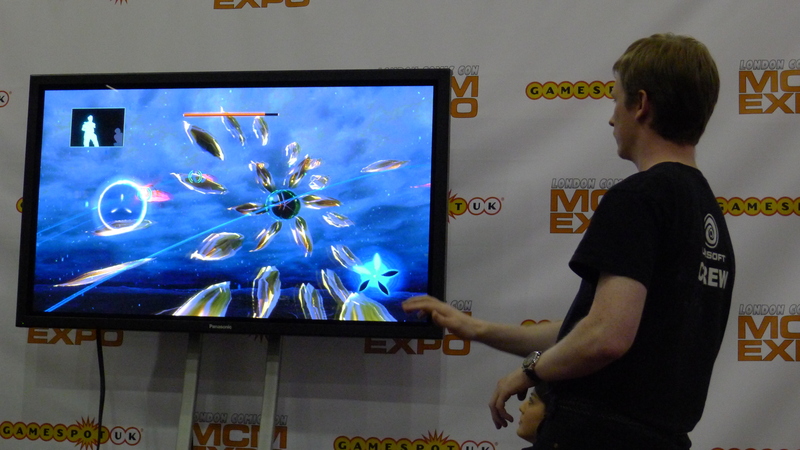 The pod to the left was showcasing a version of Green Lantern: Rise of the Manhunters, a generic brawler with squad mechanics. It looked so boring that I didn’t even bother picking up a controller. This was my first chance to try a Nintendo 3DS. 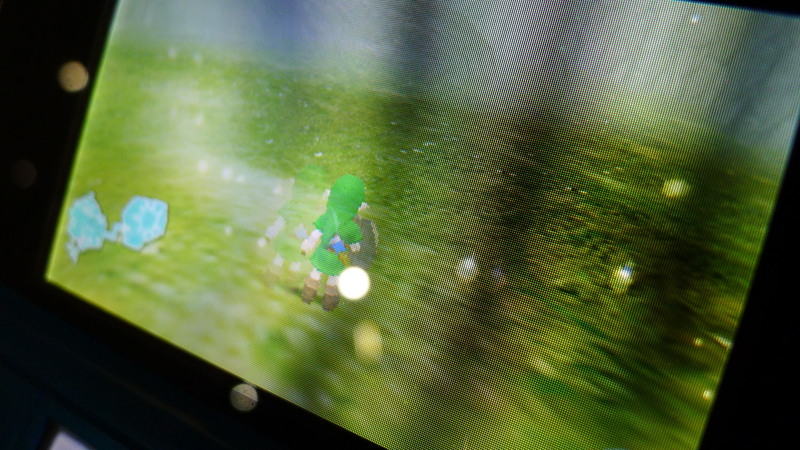 So what better way to start than with a hands on demo of Ocarina of Time? The 3D effect was subtle but significant, dropping distant vistas into the background and pulling speech bubbles out of the screen. Graphically the game was a small step up from its N64 origins, cleaning up some of the nasty edges and adding some vital new pixels. 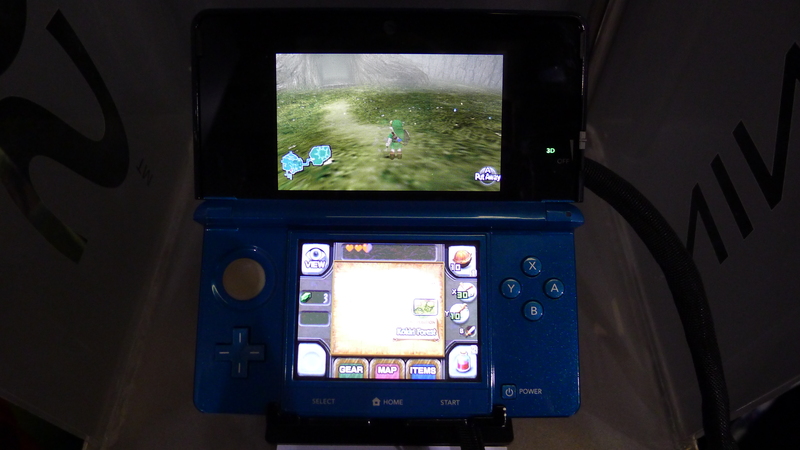 Although it hasn’t sold the system for me, newcomers to the Nintendo brand and Zelda fanboys will surely lap this up. Capturing 3D footage with a standard digital camera results in some odd effects. But you get the picture… it looks quite pretty. Dead or Alive Dimensions was just as I expected. It’s a great representation of the home console outings, but adds very little in terms of new ideas or mechanics. Scantily clad women and muscular ninjas pummel each other until one throws in the towel. 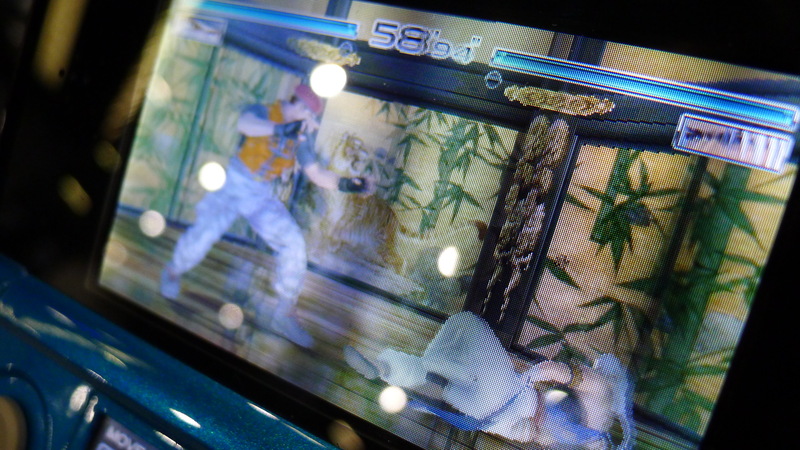 If you’ve played Dead or Alive 3 & 4, you’ll know exactly what to expect from this handheld version. 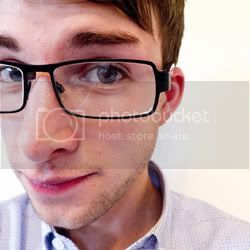 The 3D effect was pleasant, but rather unnecessary. JRPGs have a hard time trying to win my praises at the moment. This tutorial of Xenoblade Chronicles was dry and repetitive, forcing me through some mundane combat scenarios and uninspired locales. 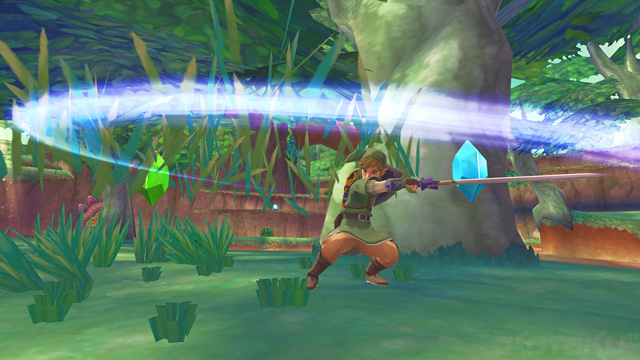 The game also suffered from sub-par graphics, looking embarrassingly last generation. Perhaps this was an unfair representation of the final game, but it left me feeling a bit bewildered and let down. 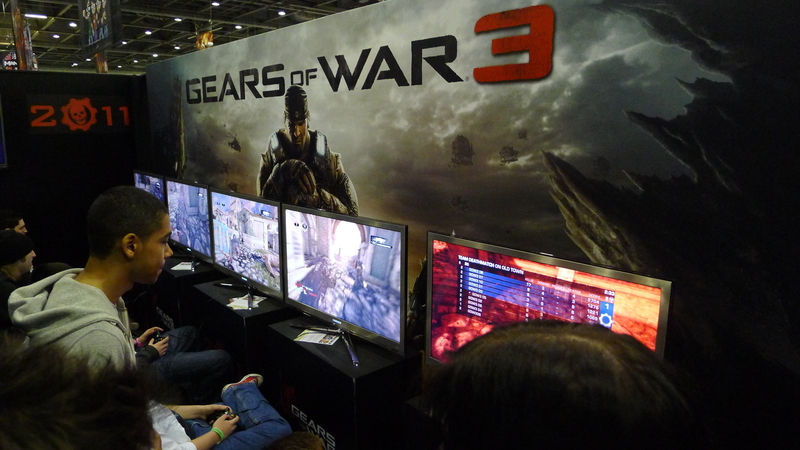 The Gears of War 3 booth was crammed with gamers all throughout the day. Epic Games was only showing the multiplayer beta that was recently made available on Xbox Live, but it was still insanely popular. It’s everything that you’d expect from a Gears title; roadie runs, chainsaw kills and hilariously bad dialogue. This will inevitably sell like hot cakes when it drops in September. This was one of my most anticipated titles of the day. 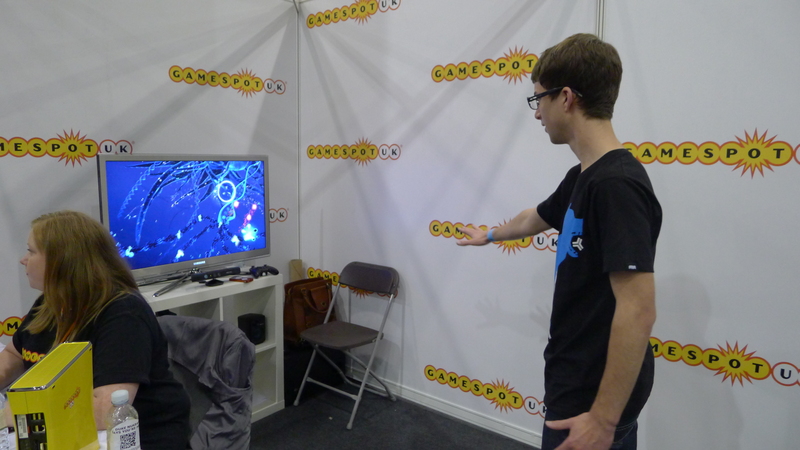 Playing Child of Eden was a fantastic experience, combining unique electronic music with engaging Kinect enabled gameplay. Using both hands to track enemies and dispatch them felt incredibly natural, especially when using the right hand to swipe at highlighted targets. This is Jane Douglas from GameSpot UK running through one of the levels. She was far more competent than me and did a great job showcasing the game during the Sunday Q&A session. Although I’m yet to purchase the Kinect accessory, this definitely piqued my curiosity and got me excited for its June release. 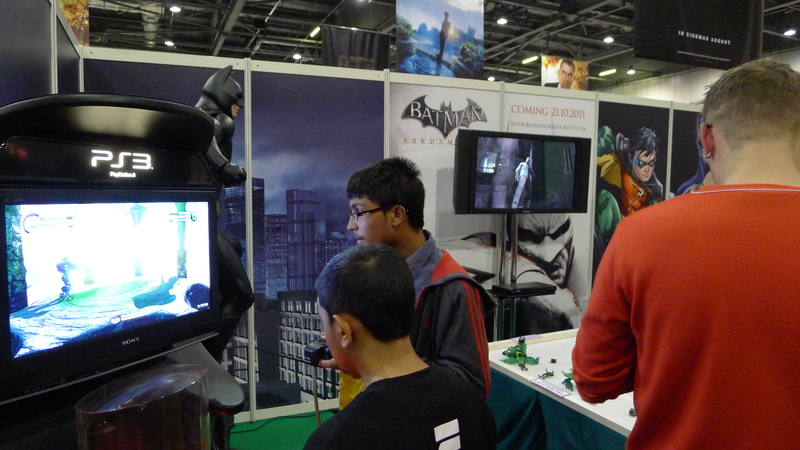 It was refreshing to see the MCM Expo take on a more video game centric approach this year. 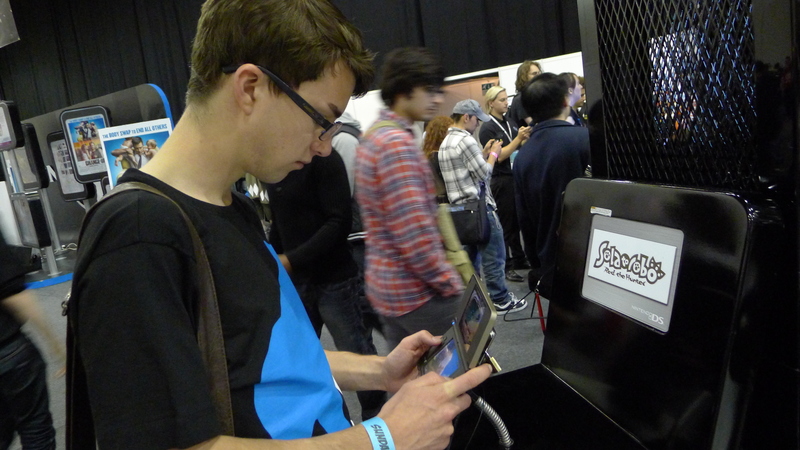 Trawling endless anime merchandise quickly becomes tiring and tedious – so the GameSpot UK stage was a welcome addition. If the team decides to come back I’d like to see an even greater variety of games and interviews, especially as the event now spans across three days. Ultimately I had a great day and look forward to visiting the convention again in October! What do the releases of Time Crisis 4, Street Fighter 4 and House of the Dead: Overkill all have in common? They’re not just elaborate sequels; all three were created and gained commercial success in the arcade. I personally have very fond memories of the traditional arcade, wasting far too much of my pocket money on trying to complete the original House of the Dead. In my local city, at least half a dozen of these dedicated gaming centres used to exist. However, now only a couple remain, tucked away as places of nostalgia. What are the reasons for this drastic change in gaming culture and has the arcade had its day? It may seem obvious, but the increasing demand and quality of home consoles has been a major blow for the local arcade. When the Sega Genesis was released, they competed against their own arcade cabinets by improving upon the classics. Altered Beast, Space Harrier and Afterburner could now all be played at the comfort of your own home. Sure, the initial price was more than a token but it meant you could play it until you finally beat the game. This also outlined one of the major faults of arcade games. Developers designed them to be infuriatingly hard, often with cheap gimmicks so that you would repeatedly put money into them. That was business. Yet when you could finally play these in your own time, you discovered their faults and in essence; how poor some of them were. As games consoles grew in popularity people expected more from games. These included a storyline, immersive characters and the ability to save a game for later. Arcades could never offer the same kind of experiences in one day bursts. One of the few features keeping arcades alive was the social scene. Especially with titles such as Street Fighter, the only way you could test your skills was to go down to your stomping ground; the arcade. The internet wasn’t around to look up every combo known to man, so when you discovered a new killer move there was only one way to brag about it. The distraught look on your opponent (who was quite often a complete stranger) when ‘K.O’ burst onto the screen simply couldn’t be replicated at home. Unfortunately, the Dreamcast took all of this away with online gameplay. Elaborate leader boards, tournaments and online statistics mean that you always know your skill level against the rest of the world. Sure, you may not be able to see them but the global village is well and truly here to stay. However, I still believe that there are gaming experiences drawing people into the arcade. In the early noughties, Dancing Stage had hit the PlayStation in a big way. Every girl capable of moving their feet had a dance mat in their own home, trying to clear the next song or difficulty. Dancing Stage, or Dance Dance Revolution as it’s known in Japan was born in the arcade. Once people realised that the traditional cabinets had better sound quality, durable pads and a leader board system the home mats became obsolete. As soon as you got past medium difficulty on the PlayStation versions, the intensity of the songs would mean that the soft mats just flew all over the place. Although they are a minority, players that take Dance Dance Revolution seriously can still be found in your local arcade. Light gun games have been successful on home consoles, but I would never say they’ve been huge. In 1998, Time Crisis 2 was praised for its two player co-operative modes and pedal cover system. To this day, I would say at least 50% of arcades still stock a Time Crisis 2 cabinet. Why? People are still playing it. The controls are simple, it’s fast and furious and the records are still being stored on its leader board. Without a heavy duty pedal and realistically sized weaponry, light gun games are incredibly difficult to replicate at home. Similarly, racing games that offer steering wheels and manual gear box simulation simply aren’t practical at home. You won’t find people actively going to the arcade for Sega Rally Championship, but it still offers a wealth of enjoyment that’s regularly by passers by. 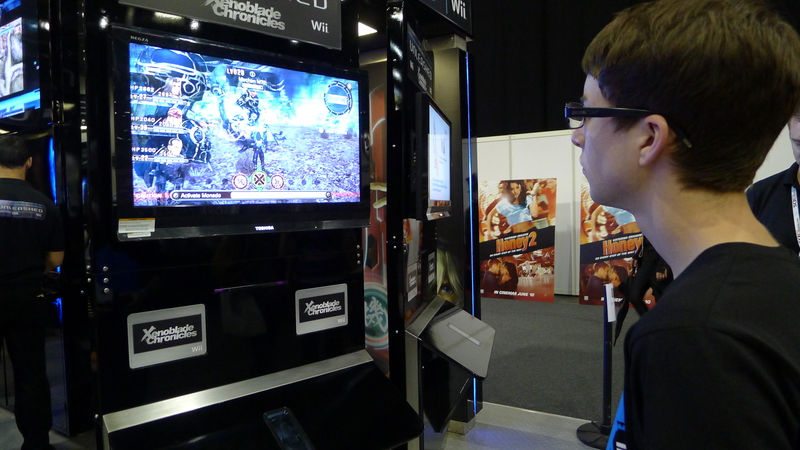 Especially in the credit crunch, many arcades are finding it harder to stay in business. Consumers are choosing to stay at home and play more of the games they’ve paid full retail price for. So which arcades are still worth visiting? If you live in the UK, FunLand/ SegaWorld go straight in at the top of my recommendation list. You can find it in the middle of the Trocadero centre in London, easily seen by the large escalator at its entrance. The arcade has multiple floors, each one dedicated to a different kind of gaming. A deck for racing, a deck for fighting and even a deck for music rhythm games, offering Japanese imports such as Guitar Freaks. Bowling and dodgems have been crammed in there as well, so if you think you’ve exhausted the capital of England this is a great way to burn some hours. None of this compares to Japan, perhaps the mother of arcades. There are hundreds you can choose from if you’re planning a visit there, but if you can only choose one, Taito Hey Akihabara is the first port of call. When big arcade developers like SNK talk about where they’ll be testing their new titles, you can bet your last Yen it’s here. Commercial success means that everything is spotless and a joy to walk around. You may have to wait for a turn on weekends, and the amount of couples can be a little daunting, but if you’re a fan of light gun games this is your Mecca. If you need a map, look here. Akihabara, Japan is a haven for traditional arcades! There are some great arcades in America, most of which can be found in tourist guides for your individual city. I could go into more detail but it’s easy to look these up in your own time. Arcades may have lost to the evolution of home console gaming, but I still feel they have an important place in our culture’s nostalgia. If it’s a Pacman cabinet in the corner of a bar or a few enthusiasts still playing Street Fighter 2, our growing industry needs to remember where it all started. Viva le tokens.